Pulling apart the GIGABYTE Brix BXPi3-4010 was as easy as removing the four screw in the feet of the unit. That’s really as far as you’ll ever need to go as all the needed parts can be installed from here. On the left we can see the pair of low profile SODIMM slots, an on the right we can see the mSATA port. 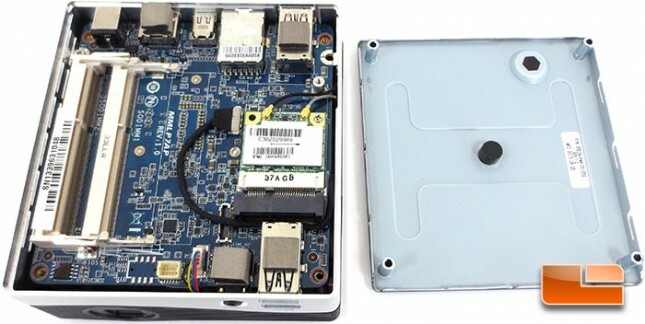 Under the mSATA port is the half-size mini PCIe slot that is currently populated by the GIGABYTE WiFi+BT card. The WiFi+BT card supports IEEE802.11 b/g/n and Bluetooth 4.0. Removing the tiny motherboard from the Brix we can see the projector PCB and projector itself still within the housing. Installing the hardware in the GIGABYTE Brix BXPi3-4010 was easy to do. The Kingston HyperX PnP SO-DIMMS snapped into place without any issues and the Intel SSD 530 Series 180GB drive installed and was recognized without a problem. Now we can close the Brix back up and see how she performs! With all of our parts installed and Windows 8 installed we were able to run the epic Windows Experience Index and see how the system rates. The GIGABYTE Brix BXPi3-4010 was right on par with what I expected to see. The overall score is determined by the lowest sub-score, in the case of the Brix BXPi3-4010 it is the graphics which squeezed out a score of 5.9. 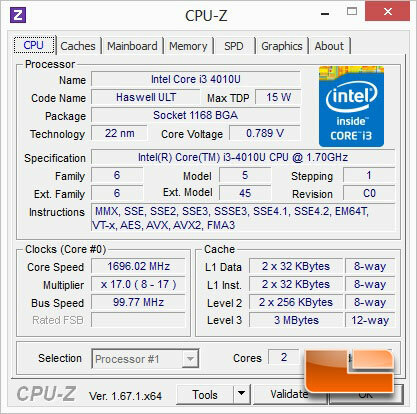 The Intel Core i3-4010U was the next lowest score hitting 6.4. From there the scores continue to climb, if the Windows Experience Index counts for anything the GIGABYTE Brix BXPi3-4010 looks like it’ll be a solid system. The GIGABYTE Brix BXPi3-4010 uses an Intel Core i3-4010U dual core four thread processor. What makes the i3-4010U ideal for a ultra small form factor like the Brix is the low TDP, only 15 Watts with a clock speed of 1.7GHz! 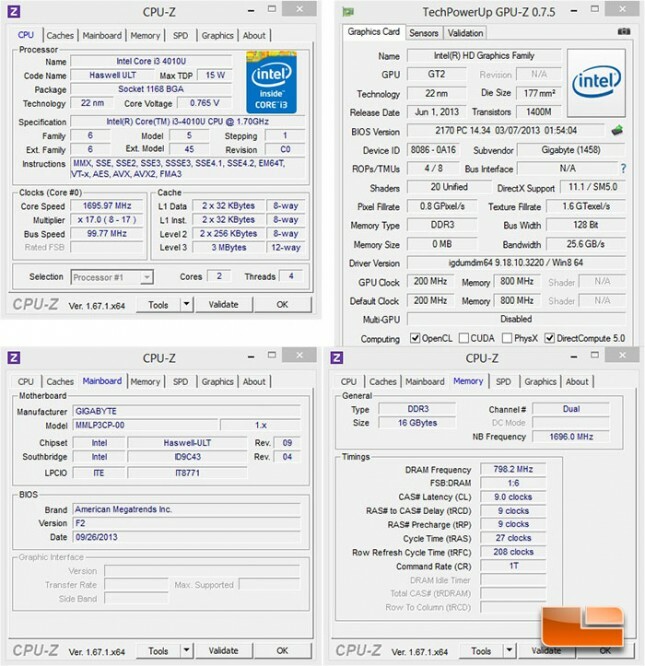 The latest iteration of GPUz, 0.7.5 doesn’t show the iGPU clock speed accurately. 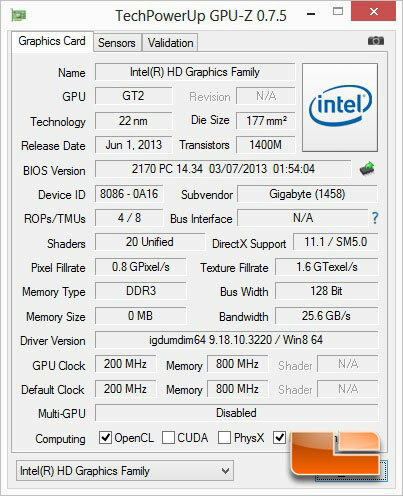 Our Intel HD 4400 graphics are currently running at 1000MHz, not the 200MHz being shown here.